There are a ton of fun ways to use them in your classroom. Check out these free downloads for some create lessons for your students. Super Teacher Worksheets offers this FREE Cootie Catcher for practicing 2X multiplication facts. Download includes folding directions and activity suggestions. Check out the Learning Bug for 16 FREE, Sample Cootie Catchers that cover math, science, and language arts for grades 2-5. Here’s one example from the Learning Bug website noted above, a 2nd Grade lesson on Irregular Plurals. Sample includes folding and activity directions. This pirate-themed cootie catcher provides students with Mixed Integer Operations. Check out the free download at For the Love of Teaching. 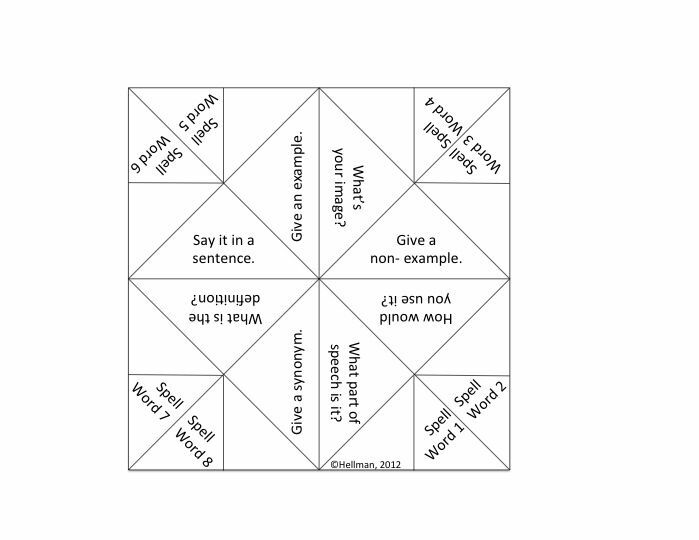 Use this Marzano Vocabulary Cootie Catcher template to review vocabulary words. Students will say and spell words, as well as provide synonyms, part of speech, definitions, and sentences using the word. If you or your students need a quick Cootie Catcher refresher course check out the folding directions at Babysitter Blab. You can find even more resources here: Cootie Catcher Folding Instructions and Cootie Catchers Video. Coolest of all is this FREE PowerPoint Cootie Catcher Template from Downloadable Cootie Catchers. Download this easy-to-edit template using PowerPoint. Click on each section to drop in a graphic or edit the text. Then just print and go. Great for reviewing math, vocabulary, or grammar! For a simpler, low-tech approach download this FREE Cootie Catcher Template from Tonya’s Treats for Teachers or a similar one from BillyBear4Kids.com. Whether you download a cootie catcher or make your own, you’re students will love this fun, hands-on activity! Looking for other fun ways to teach challenging content? Check out these resources! Looking for print-and-go, intercurricular resources to help students understand how to read, measure, and sequence time? How Calendars Began: Print-and Go~ Read, Review, and Apply Timeline Skills. Buy this bundle and save over 20% off the individual prices of these two kid-friendly resources! * Easy-to-read, full-page answer keys. * Reading selection that provides an overview of how calendars evolved in different civilizations from 48 BC to present day. * Lesson 1, Vocabulary Comprehension~ reread, locate key words, use context clues, and infer. * Lesson 2, Locating Details in the Text~ set reader purpose, skim, and locate key words. * Lesson 3, Sequencing~ locate key words, set reader purpose, and adjust reading rate. * Lesson 4, Read and Use a Timeline~ visualize, text connections, evaluate understanding, use date labels (BC/AD/BCE/CE). * Post Test~ easy-to-grade, ten (10) question quiz for final assessment. Lessons contain clear, step-by-step directions with sample answers or examples. Students respond to text in a variety of ways: fill-in-the-blank, circling, boxing, T/F, short essay response, math computation, putting details in number order, and elimination. Also incorporated on the student pages are special “Be a Learning Detective” activities that require a variety of responses– drawing, writing, or doing math calculations. These activities directly relate to the content, reinforcing text-to-self connections. All lesson activities are easy to check– independently, in pairs, or whole class. Students can easily prepare for the final assessment, as well, by compiling and reviewing the lesson worksheets. BONUS: Included in bundle is an additional supplement, Teaching Challenging Reading Content Across the Curriculum. This easy-to-use guide had 19 no-prep teaching strategies. Using these ideas you’ll quickly adapt any lesson with reading content for use with whole-group, small group, student pairs, or independent student work. IMPORTANT: Please use the links below to explore each resource and to make sure you are not ordering more than one copy of the same product. Each resource explores a single topic using three versions of a single paragraph. Students in a single classroom may have very different writing skills. Each of these NO PREP resources includes three versions of the same scrambled paragraph. Students working at or below grade level, or in need of an additional challenge, can all work together by using different levels of the same content. Each of these resources has three paragraph levels. All three paragraphs, whether they are five or eight sentences, can be put together only one way. Students use transitions and inferential clues to assemble the sentences into an organized, logical paragraph. Even reluctant writers will experience success and gain confidence. Ready-to-use printables! Just copy and go! – 3 of the 4 resources also include a student worksheet for additional practice. — a closing sentence, or clincher. Like training wheels on a bicycle, working with scrambled paragraphs helps students understand the importance of writing their own ideas in a clear, organized manner. Students find it much more satisfying to “build” an organized paragraph than to revise a disorganized one. — sequencing details and events. The bundles include two different Paragraph Graphic Organizers for students to use to draft their own writing. This pre-writing tool is very useful for student writers. By filling in the graphic organizer in the same manner they organized the scrambled paragraph sentences, students soon learn how easy it can be to write in a clear, logical manner.